The episode starts exactly where last week’s one left us at. The Doctor’s party jump and they find themselves caught by the Byzantium’s still existent gravity field. They have also landed on the outside of the Byzantium, upside down. They enter the ship, but are -of course- followed by the Angels. Father Octavian once again threatens River and my suspicions that she’s a prisoner are confirmed. The Doctor and the others manage to escape and enter the control room and through a hidden door there discover the Oxygen Factory of the ship- a borg tree forest! I’ve seen forests meant for production of oxygen on spaceships before (Sunshine, for instance) but a borg tree forest, man that’s fantastic and makes my geeky smile emerge. Amy seems similarly impressed by it but then Angel Bob calls the Doctor. As Bob reveals the plan of the Angels to absorb the entire universe they realise that Amy is being a creep and has been counting downwards from ten for several minutes without realising it. Just then the Doctor notices a crack on the wall, the exact shape of the one that has been so far following us through the season, bar the previous episode. The Doctor sends everyone away through the forest and stays behind to examine it only to declare that “That’s extremely very not good” before noticing he is surrounded by Angels. In the meantime Amy obviously doesn’t feel very well and lies down in the forest in fetal position, grasping her head. Back in the control room the Doctor escapes, minus his coat, and follows the others. They figure out that Amy has a Weeping Angel in the visual centres of her mind. The Doctor tells her if she opens her eyes for more than a second, the Angel will escape and she will die. So as Amy is unable to see the Doctor leaves her with the clerics to protect her from the incoming Angels as the Doctor, River and Father Octavian head off to find a way to stop the Angels and Octavian drops the bomb that River is his prisoner. The Angels start to tamper with the connections of the borg trees to make the lights flicker and keep on advancing on Amy and the clerics. 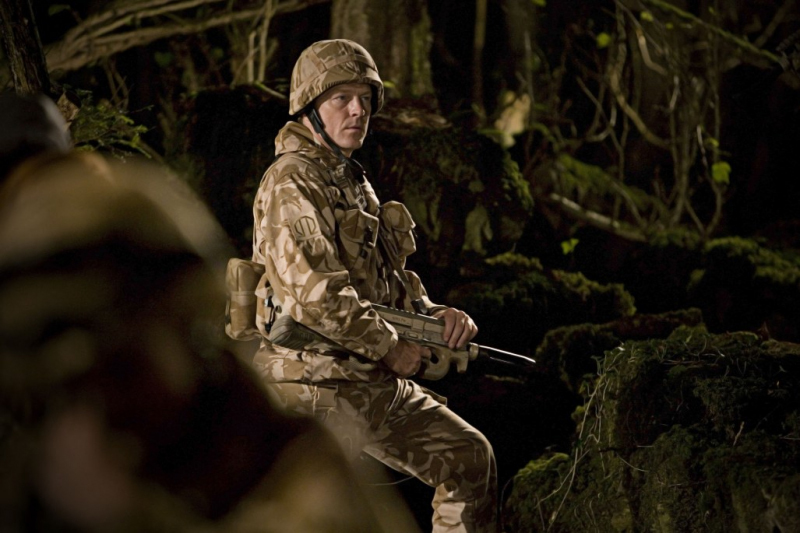 The Doctor has an epiphany and realises that Time can be rewritten while back in the forest the Angels leave when a light comes from the vault. Two clerics go to investigate and Amy opens here eyes for (less than) a second to state that it’s the same crack from her wall. The remaining clerics forget about the existence of the other two, and then a third cleric goes to investigate. The one remaining cleric forgets about the others’ existence, questioning Amy. But then he also goes to check the light out, leaves Amy his communicator and disappears. The Doctor and Father Octavian continue, but an Angel grabs Father Octavian by the neck. Apparently they’re not benign anymore and have devised different ways to kill than send you back in time. We saw that in the previous ep as well but then I supposed it was because they were extremely weakened. Before Octavian is killed, he tells the Doctor that River Song was a prisoner because she killed a man; a good man then tells the Doctor to leave him. The Doctor is shaken and as he does leave we can hear the Father’s neck snapping. 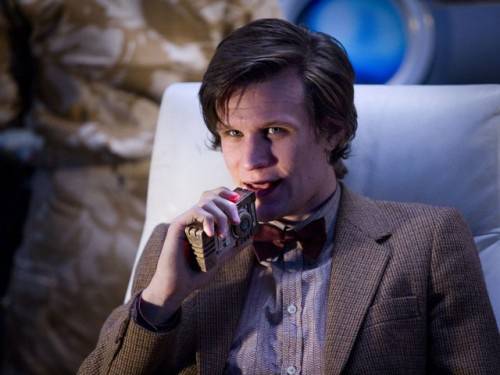 The Doctor enters the next room where is River with a teleport device which is apparently dead though. 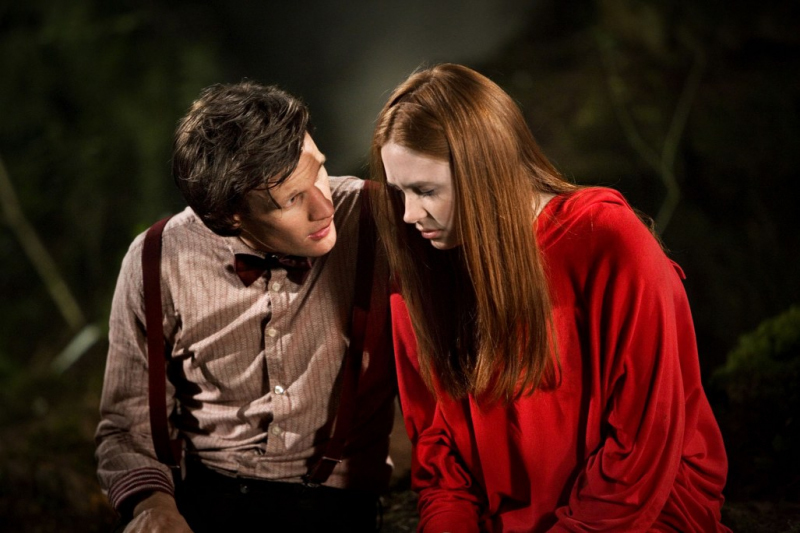 Amy manages to contact the Doctor and tells him that the clerics are gone. The Doctor says the crack is Time itself running out and that’s why the clerics wouldn’t remember each other. He then tells Amy she must go to him to the control room. And with her eyes closed, she follows his sonic screwdriver signal. 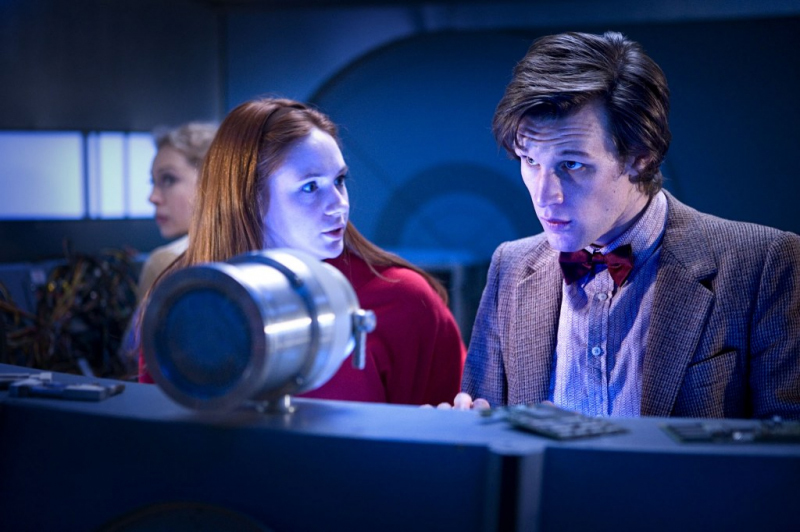 Amy demands of the Doctor to tell her what the crack would do to her and he says that it would erase her from time itself. She would have never been born. The Doctor speculates that the crack is allowing time to be rewritten and River asks him how they can close it, with the Doctor retorts that a complicated space-time event can close it: himself. He did seem to snap at people loads in this episode, no? The Angels arrive and surround Amy, whose communicator starts to beep to indicate there are Angels around her. The Doctor tells her that the Angels are still scared and just follow their instincts around her to freeze to stone, but Amy soon gives herself away as blind and the Angels close in to kill her but just in time, River teleports her to the control room. 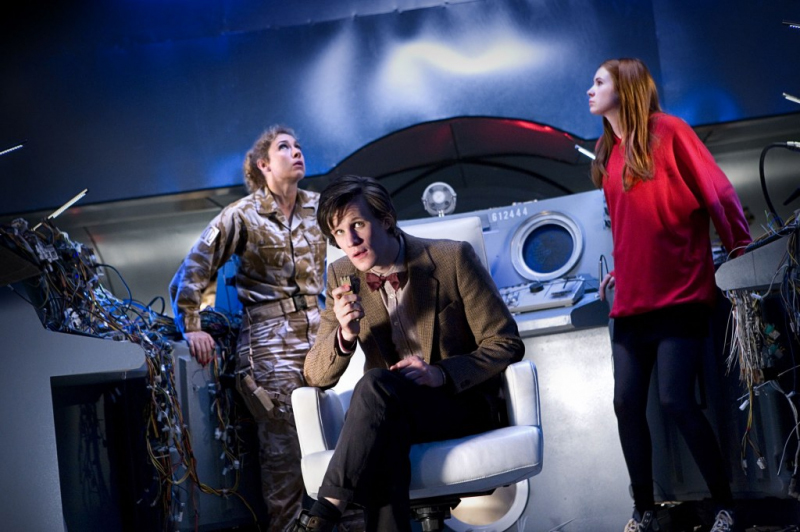 The Doctor exclaims that he could just kiss River to which she replies “Maybe when you’re older” which rules out the rumour that River is the Doctor’s mum. All the Angels gather at the entrance of the room as they drain energy from the doors, which then open. Angel Bob, demands that the Doctor throws himself into the crack in order to save the Angels, Amy and River from it. River, as a time traveller, wants to throw herself in but the Doctor laughs at the idea, claiming that she is not even as complicated as one Angel and that only all the Angels are equivalent to him. Given this, the Doctor tells his friends to hold on to something and he collapses the artificial gravity, sending all the frozen Angels into the crack similar to vanquishing the Cybermen and Daleks in Doomsday.. This is enough to seal it, erasing them all from existence. The group escapes to the outside of the temple, Amy safe now that the Angel in her mind has been erased from time. They remember those erased from time because they are time travellers themselves. River tells the Doctor she will see him again when the Pandorica opens and that the man she murdered was the best man she’d ever known which makes me believe that she killed the Doctor himself :S I also look forward to see Pandorica and River once again! She is then teleported back to the penal ship, with the remaining clerics. Amy tells the Doctor to take her home where, she reveals to him that she is getting married in the morning and tries to seduce him. LMAO I didn’t see that one coming. Out of all the companions (except Donna of course) Amy is the one I least expected to make a move on the Doctor 😛 He declines and realises that she is at the centre of all the cracks and that the time explosion which created them occurs today, the day of her wedding which is (if all episodes are not interrupted) the final episode date of Series 5. He quickly whisks her away in order to try to sort the issue out. There’s a funny moment where River says that it must always end with handcuffs with her and the Doctor. This is unknowingly referencing “Forest of the Dead” where River cuffed herself to a post to help the Doctor survive, thus sacrificing herself. SPN: The 100th episode’s plot, teaser and clips!! 100 episodes are a big deal about a show. It’s like the silver anniversary of a wedding. 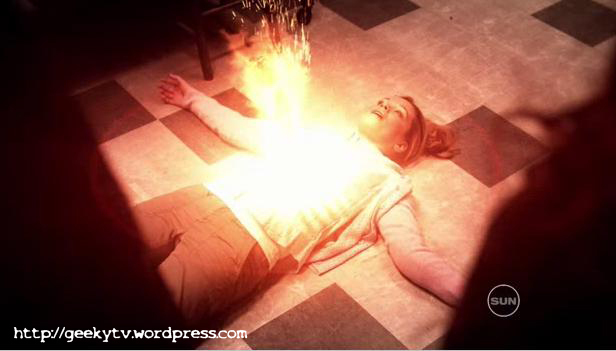 The next Supernatural episode is #100 and it is greatly anticipated by the show’s fans. It’s called “Point of No Return” and here’s the plot and some videos from it! Dean begins to think the only way to stop Lucifer is to say yes to Michael, but the angels decide they don’t need him anymore. Dean, Sam and Castiel are horrified at the angels’ new game plan and take on Zachariah to prevent an all out war on Earth. Meanwhile, a familiar face returns. 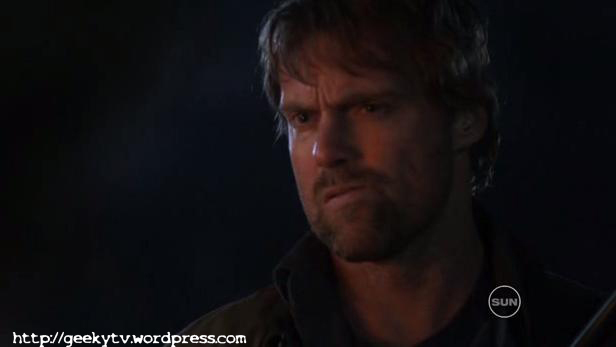 My GOD what an episode that was 😮 First of all I went in fangirl mode because of Michael Shanks. I am very fond of him and it was nice to see him again! This has to be one of the best and most EPIC episodes of Season 5. It reminded me a lot of the 2nd& 3rd season and compared to last week’s mild episode this was right the fix I needed! to drive the way the demons with Holy Water, they also know how to exorcise them! Turns out it is a whole town of hunters, led by Leah the daughter of the town’s priest who claims the angels talk to her and Dean identifies her as a prophet. they’ll all die soon anyway so it doesn’t matter. curfew time and Sam goes back to the hotel where he confronts Dean, telling him that knowing he has his back is the only thing keeping him going. Dean leaves despite curfew and heads to the bar where he finds the barkeeper being attacked by townsfolk. Leah had another vision and now the angels want to get rid of all the unbelievers. He doesn’t want to leave his hometown though and the priest tries to calm everyone down. Out of nowhere Dylan’s mother shoots the barkeeper, killing him. fills them in about what happened at the bar. 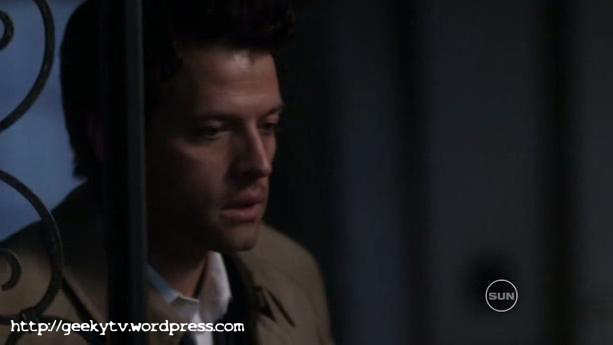 Castiel says that Leah isn’t a prophet as he has all the prophets names imprinted on his mind and she’s not one of them. Instead, she is the Whore of Babylon and her purpose is to condemn as many souls as possible to Hell before D-Day and that she probably killed Leah a long time ago. She can only be killed by a true servant of God, using a carved piece of Babylonian wood. Lacking a true servant of God, Castiel being a fallen angel, Dean is not a believer and Sam is an abomination, they try to recruit Leah’s father. He, of course, refuses at first but then admits that she’s not acting like his daughter and agrees to kill her. At the compound they find her and her followers having locked up all of the “unbelievers” and intend to burn them all, including the children. The Winchesters, Castiel and the priest attack her but they’re unable to harm her as she possesses some kind of telekinetic powers. Dean fights with her and at the last second stabs her with the Babylonian Stake. To everyone’s surprise she dies. Sam asks Dean how he did that but Dean says he doesn’t know. Sam is clearly panicked and wants to know if Dean is going to say yes to Michael. Dean says, “Do you really think I’d do that?” but his face speaks volumes and Sam is terrified. They return at the hotel where they tend to the priest’s wounds. 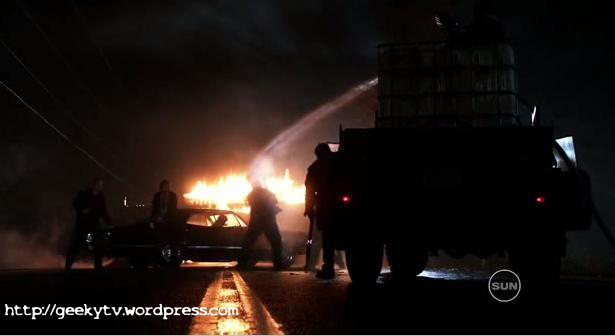 Dean offers to bring more bandages but drives off in the Impala instead, leaving Sam behind. Dean arrives at a house, and rings the doorbell. Lisa (3×02 The Kids are alright) answers. Dean asks how she’s doing and she says she’s doing good, but wants to know what he’s doing there. He tells her things are about to get really, really bad. She wants to know if it’s related to what he does and he admits it is. He tells her that he’s never really been happy, but when he imagines himself happy it’s always with her and Ben. She’s overwhelmed by that revelation and invites him in but Dean says he can’t and he just came to say goodbye. She tells him he’s scaring her, and she again asks him to come in and that whatever he’s thinking about doing, he has to think twice about. He tells her he’s not giving in without some guarantees, and one of them is that Lisa and Ben will be kept safe. The episode ends implying Dean is finally going to say yes to Michael. He is sick of having people die all around him has seen Heaven and he has seen Hell and also what people would be able to do to earn a place in Heaven. There is no help and he doesn’t see a way out. There’s only a thing he can do to help at least lessen the damage. He can’t feel family with Sam anymore (ever since the last episode) having witnessed that Sam was happier when he was away from him and their dad. What he fails to see is that Sam doesn’t want to go away anymore but tries to cling onto what’s left of his family- ie Dean. Something tells me that we won’t escape a showdown between the brothers and that both are going to agree to become vessels. The season is approaching its end and the episodes are bound to be ridden with action and cliffhangers! I REALLY can’t wait for the next episode! Despite my husband’s opinion about this episode, I liked it. 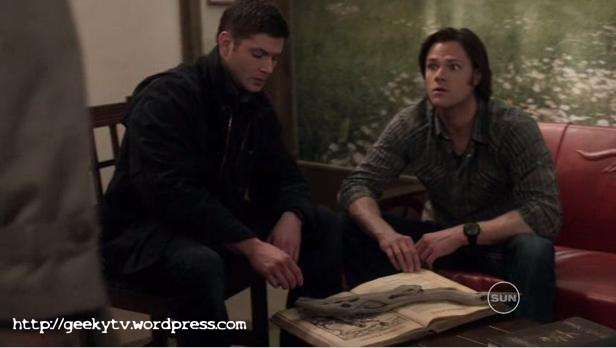 It was more a transitional episode than a lore one but I always love seeing kid!Winchesters. It was also interesting that we found out that John and Mary weren’t the couple we thought they were for the last five years and that they even separated for a short while. It caught me completely off-guard when the brothers were actually shot and killed. I missed the “Previously” so it came as a complete surprise 😮 It was so great to see Pamela and Ash again. Ash’s humour factor was a win-win. However something tells me that those weren’t really Pamela and Ash, mostly due to the “who cares” attitude towards death. OK you’re in heaven but meh. Life>Heaven in afterlife. Always. Those poor poor kids, Sam and Dean 😦 They never had a childhood. Sam doesn’t even remember Mary ;_; It makes my heart ache. That’s probably because I have a son of my own. Honestly though, Sam’s look when he saw his mum said it all. Other than that I wasn’t really surprised when Joshua said God wasn’t interested. It would be too easy. My gut tells me we’re getting Michael – Lucifer showdown in the end.